Hurricane Irma struck Jacksonville less than 11 months after Hurricane Matthew hit. In fact, there are many people still recovering from Matthew. Now it’s as if they have to start all over again with their cleanup. Just because you’ve weathered the storm doesn’t mean you can take care of your cleanup all by yourself. If you want to get your property back to the way it was fast, then you’ll need to bring in help from Junk King Jacksonville. Junk King Jacksonville has been in the junk removal business for several years. They understand this community and know how important it is to provide a rapid response for hurricane cleanup. The first concern is mold growth. That can only happen when soggy or waterlogged items are left behind in a house where humidity creates the perfect growing ground for the fungus. Floors and walls that have been saturated with water need to be dried out completely. That might mean pulling up carpets and cutting out sections of drywall and handling. That’s a huge pile of mess that needs to be taken out of the home and placed on the lawn for quick pick up. That’s where Junk King Jacksonville can spring into action. Every session set up by Junk King Jacksonville for hurricane cleanup will come with two strong movers and a big truck. This is a team that will do all the heavy lifting for you. Even if you don’t have your stuff out on the lawn yet, the crew from Junk King Jacksonville can make that happen. If you’re dealing with a massive type of clean up, then Junk King will send over additional crews and trucks to make sure everything is removed in a single session. Even if your hurricane cleanup takes several hours won’t be paying labor costs. Instead, you’ll be paying a flat fee that will be based upon how the crews will pack up the truck. They’ll know by looking over all the things you want to get rid of just how much space you’ll be using on the truck. That’s how they will determine your estimate. It’s the same fair and affordable price they were charging before the storm. 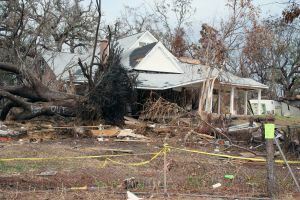 If you want to take care of your hurricane cleanup fast, then count on Junk King Jacksonville to get it done. This entry was posted in Jacksonville storm debris removal and tagged hurricane cleanup, Junk King, junk removal, storm debris on September 26, 2017 by Junk King. Last updated September 26, 2017 .